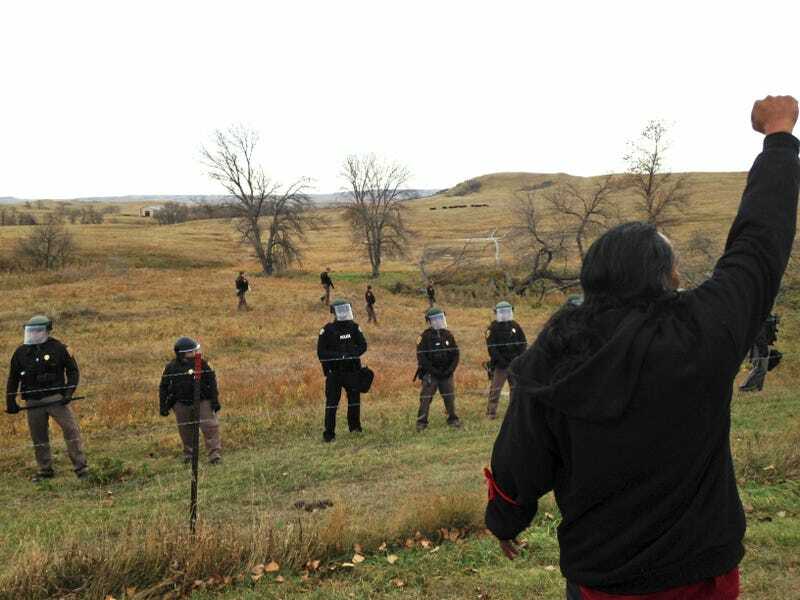 The Guardian reported on Friday that FBI agents whose job it is in theory to prevent domestic terrorist attacks have been investigating environmentalist and indigenous rights activists who protested the construction of the Dakota Access oil pipeline. Multiple joint terrorism taskforce (JTTF) officers have contacted people connected to the Standing Rock water protection movement, The Guardian reports. The scope of the JTTF investigation remains unknown. In an interview with The Guardian, Lauren Regan—an attorney and director of the Civil Liberties Defense Center in Oregon, who’s provided legal counsel for some Standing Rock organizers in the past—called the FBI’s actions, “unwarranted” and “unconstitutional.” Regan said she is aware of at least three cases where law enforcement appeared at organizers’ doors without a subpoena or warrant and tried to coerce them into voluntarily giving them interviews, but none of them complied. “The idea that the government would attempt to construe this indigenous-led non-violet movement into some kind of domestic terrorism investigation is unfathomable to me,” Regan said. The JTTF has a recent history of targeting non-violent activists who nonetheless are a bother to the state, most notably its monitoring of a Black Lives Matter demonstration in Minnesota in 2014. Federal and local authorities have for some time now been laying the groundwork to construe peaceful activists demonstrating on behalf of environmental and human rights as a threat to social order, safety, and even the earth itself. Earlier this month, for instance, Michael Black, the acting assistant secretary of Indian Affairs, argued in a statement that evicting the few remaining active pipeline resisters from their camps was, “a matter of public health and safety.” Meanwhile, Army Corps officials complained that the protesters’ mere presence on land desired by pipeline developers was causing soil erosion. Throughout the height of the Standing Rock protests this fall, officials argued that protesters should vacate their camps for their own protection. At the same time, cops were assaulting organizers with rubber bullets and tear gas, and arresting them in droves. In January, North Dakota representative Keith Kempenich proposed a bill that would shield drivers who accidentally run over protesters from liability. Which is all to say, of course, that Standing Rock protesters have been targeted by law enforcement every which way and will need ongoing attention and support. But also that law enforcement has been particularly creepy and invasive in its desire to control every detail of the Standing Rock protest narrative. A JTTF officer who showed up (also unannounced and unwanted) in the hospital room of 21-year-old Standing Rock activist injured by police in November reportedly took the young woman’s clothes and has yet to return them.